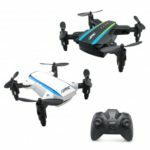 The mini drone is the best choice for a newborn drone lover. Featured gesture sensing design, it can be controlled with one hand. 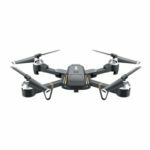 Equipped with built-in barometer, the altitude hold function provides stable flight at a fixed height until you manually make adjustments with the controller. Lightweight and foldable, you can take it anywhere for fun. 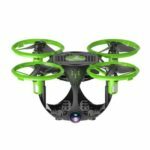 The RC drone can be operated with one hand, allowing you to experience technological innovation. 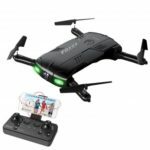 Control the drone to take off / land by double click, no complex operations needed, simple and convenient. 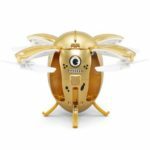 Press the key for 2 seconds, the drone will roll in the air at 360 degree, giving a cool aerobatic show. 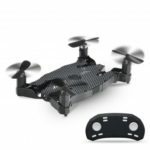 Powerful barometer altitude hold function allows you to release the throttle stick and the RC drone will keep hovering at current height. External LED light for safe flight at night, also looks gorgeous and beautiful. Weighing only 200g lightweight, can be folded into a pocket size, easy to carry.